I'm not finished with the fawns. 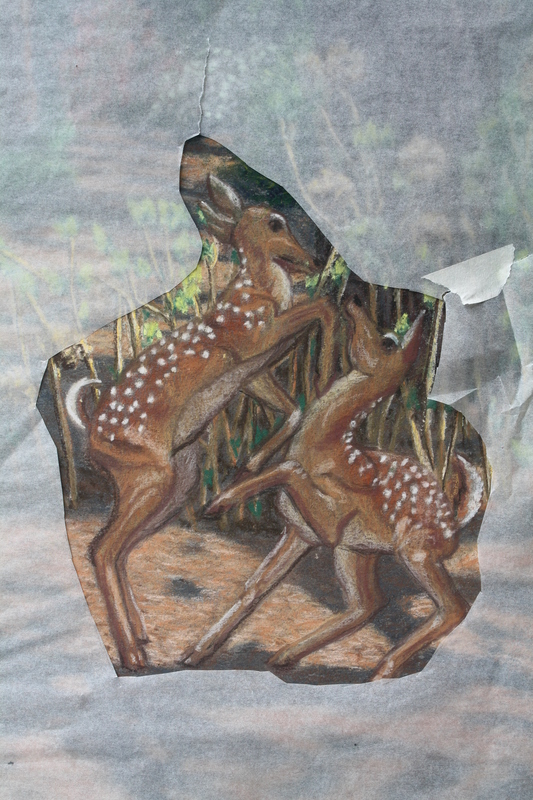 I took the paper off my drawing board and taped it to the sketch book, and covered it with glassiene paper to protect the pastel from smearing in the parts with layers built up ,while I work on the fawns.The museum has a policy of pencils only, and they limit your paper size. You can get a permission paper allowing you to bring an easle or other media in, but I can’t plan that far in advance to list dates and times I’ll be there with my easle. Outside in the sculpture garden ,they don’t care. But in the galleries, I just stick to holding my sketchbook in hand while drawing, instead of bringing my easle.And I used my pastel pencils here. 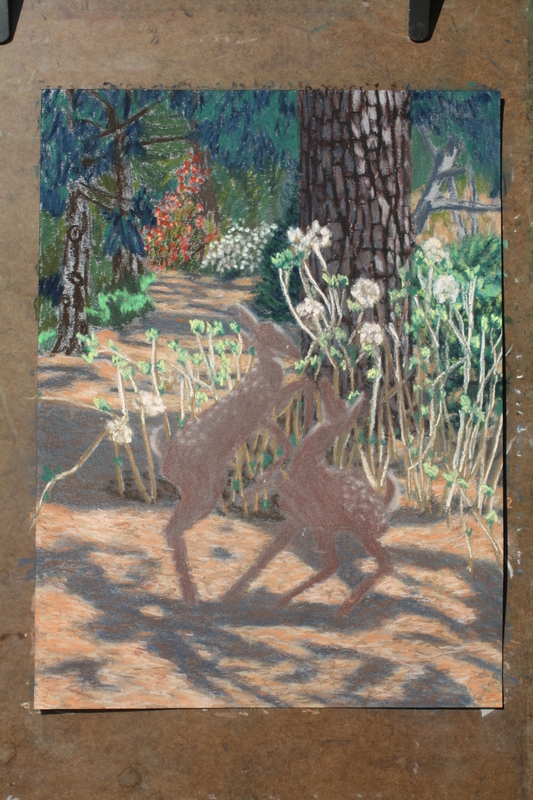 The pencils don’t have the brightness and pigment that is in regular pastels, so I think the fawns look a little weak next to the rest of the picture. I’ll have to do something about that.Also the fawns sculpture in the museum is made of aluminum, and its not colored like real fawns, so I took my best guess on the colors here. I got the middle ground under control. I usually start with building up the background first, because working from top to bottom keeps pastel dust from falling on to finished parts. But here, I worked on the middle ground first because I wanted to get the spring foliage in before it goes away. I put layers of pastel on the Loblolly pine to make the bark texture. I don’t have dark enough pastels to make a dark enough black, so I used my charcoal pencil in the cracks of the bark. Sometimes you hear people say, ” don’t use black. ” But I use it when I need it, and I don’t see the mud. Do you see mud ? Artists, don’t fear black. The tree looked too red with my first colors, So I put in some grey, and didn’t blend it. Then it was too grey, so I put some burnt umber on top of the grey. Then I liked it. There’s a lot of layers of pastel on the path . I adjusted the colors and values a few times till I got close to what I see. I got the sticks back in the picture from the dried hydrangeas around the pine tree. And I scrubbed the brown out of the fawns with a dry sponge, but the color is still there. Now I can go back to the museum with pastel pencils and conte pencils and finish the fawns. I didn’t work on the top background of the picture yet, or make the background trees visible yet . That’s still one layer of color. I get better results standing in front of my subject and drawing slowly, than I get tracing from a photo. You can see a faint grid I made when I used the head as a unit of measure to make my fawns come out in correct proportion. I didn’t work on shadows yet. You can also see faint marks from when I traced this study and transfered it to the other paper. You can see the texture of the paper showing through. It’s yellow paper. I finished the drawing last week. 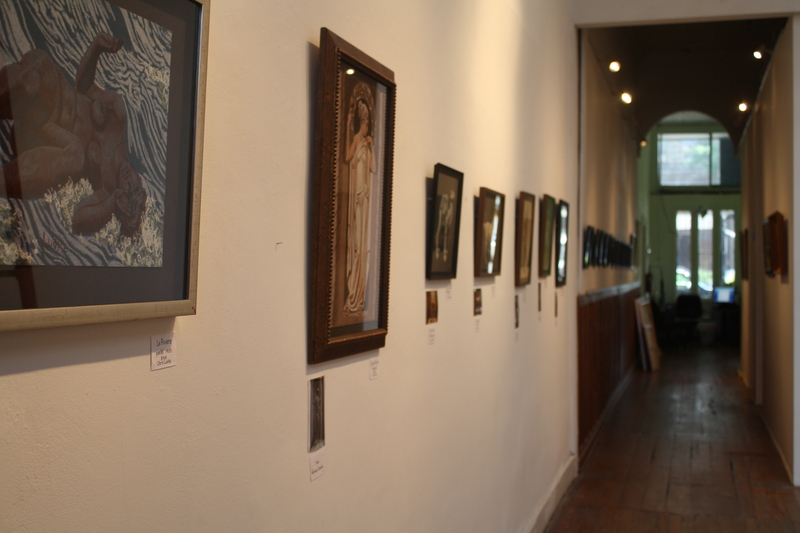 It’s hanging at Crossroads Art Center. But it won’t show up on my website for a couple weeks, because I didn’t send the web master the image yet. This is only a small section of the finished pastel. The scene is at Lewis Ginter Botanical Garden. The fawns are at the VMFA. This is my best guess for color, because the ones at the museum are the silvery aluminum color. I have the plan worked out. 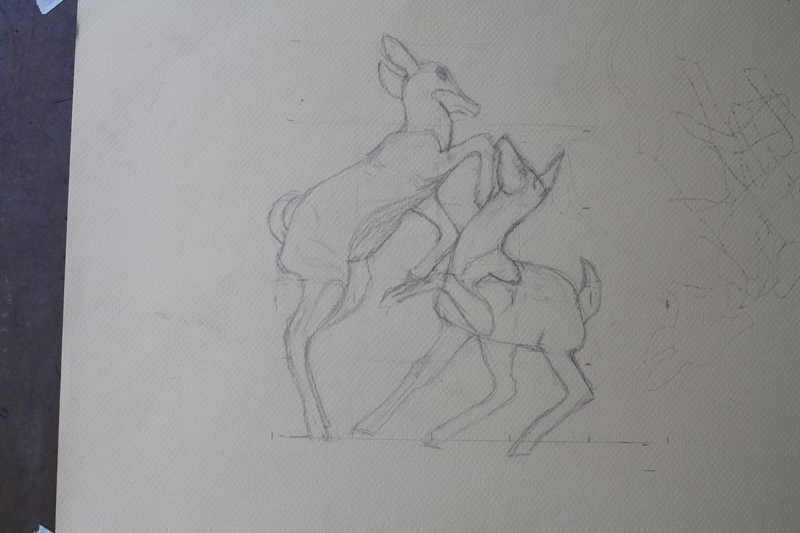 A few months ago I made some sketches at the VMFA of the 2 fawns playing. Then I scouted around a lot to find a scene for them. 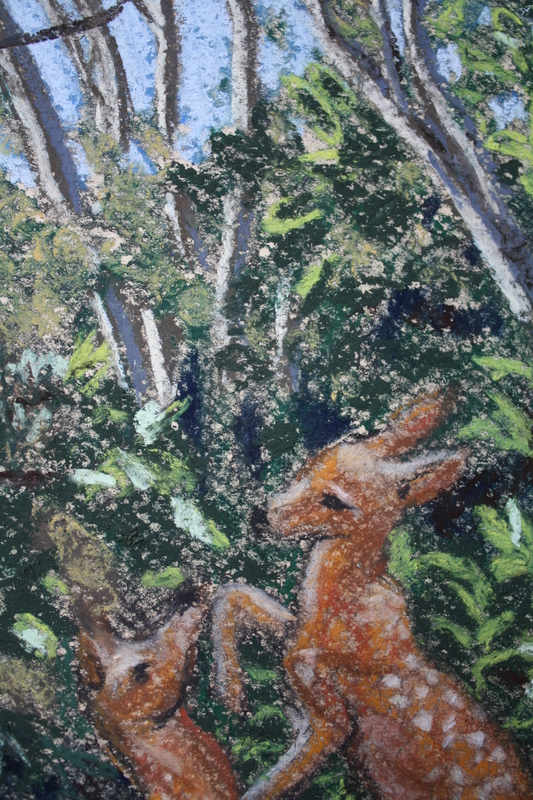 This is my charcoal sketch with the fawns at Lewis Ginter Botanical Gardens. 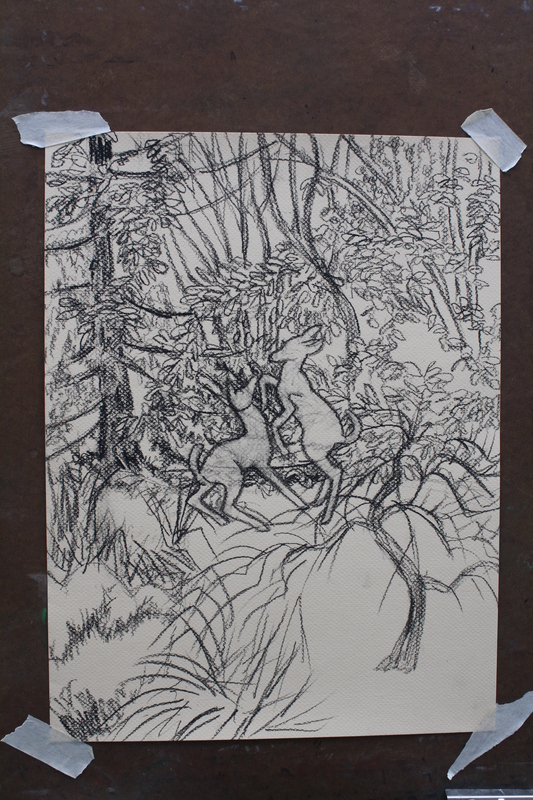 I saved a space for them, but I need to go back to the museum next with pencils and work on the fawns again ,so I can put some volume into them. Then I’ll get the foliage in pastel. I took a shot at this stage of completion so you can see why its taking me a long time to get this finished. But good art is worth the wait, right ?